Feeling down in the dumps? 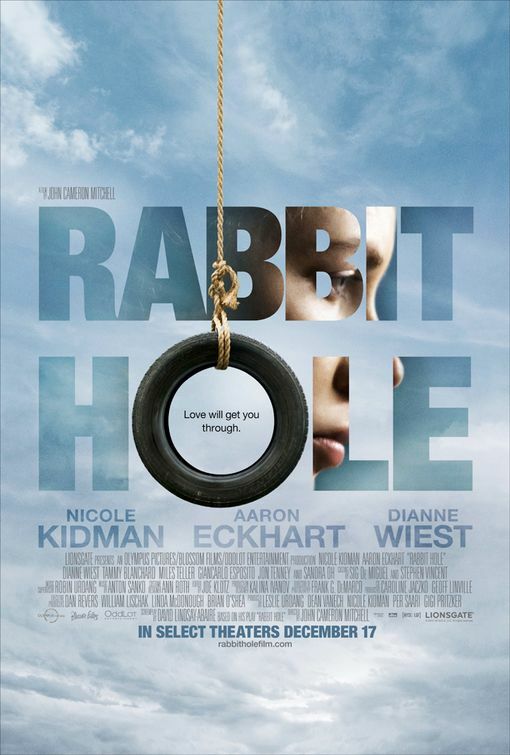 Then you may want to steer clear of Rabbit Hole, an extremely depressing film that follows the lives of a grieving couple eight months after their 4-year-old son was tragically killed. The parents, Becca and Howie (played by Nicole Kidman and Aaron Eckhart), are desperately trying to get their lives back on track. They try going to support groups, but Becca has issues with how other couples turn to religion for healing. They entertain thoughts of selling the house, getting rid of their child’s belongings and thinking of everything they can to distance themselves from the situation. Nothing seems to work. It doesn’t help that there are signs of their child everywhere. Becca’s sister (Tammy Blanchard) announces that she’s pregnant, which brings out natural feelings of jealousy. The family’s dog brings back memories; after all, it was this dog that their son was chasing after when he was tragically hit by a car. Even seeing mothers with their children in a grocery store raises signs of grief in Becca. She is considerably worse off than Howie, who deals with his issues in more subdued ways. As you can expect, this is all pretty brutal stuff. Watching the parents fight with each other while trying to obtain some resemblance of the life they used to have can be really hard to watch. This is because of incredibly powerful performances from Kidman and Eckhart, who together have fantastic chemistry. Their roles in Rabbit Hole rank among their career best, and they take a seemingly basic plot and push it to another level. The movie seems like something that has been seen and heard before, but it rises a step above others thanks to its magnificent acting. Thankfully, director John Cameron Mitchell found a way to squeeze in some bits of humor to try to occasionally lighten the mood. One scene in particular had me busting up when Howie and an acquaintance (Sandra Oh) at the support group enter the meeting while stoned out of their minds. These moments of laughter are few and far in between, but they are very welcome when they appear. Rabbit Hole requires one to be in the right mood upon watching, and tissues should definitely be on hand while doing so. This is a movie that is oftentimes uncomfortable, but it is a very well told story aided by great performances. It’s a shame that this slipped under the radar last year, as it is one of the better 2010 releases I have seen. This film has some real tough material to handle, but I have to say that Kidman and Eckhart really held me over for this whole film. Good Review! Completely agree, Dan. Kidman and Eckhart were truly great in this movie.